The military did not say whom they suspected of smuggling the weapons. DUBAI, United Arab Emirates — The U.S. military said early Friday it seized over 1,000 Kalashnikov assault rifles being smuggled by small ships in the Gulf of Aden amid the ongoing war in nearby Yemen. 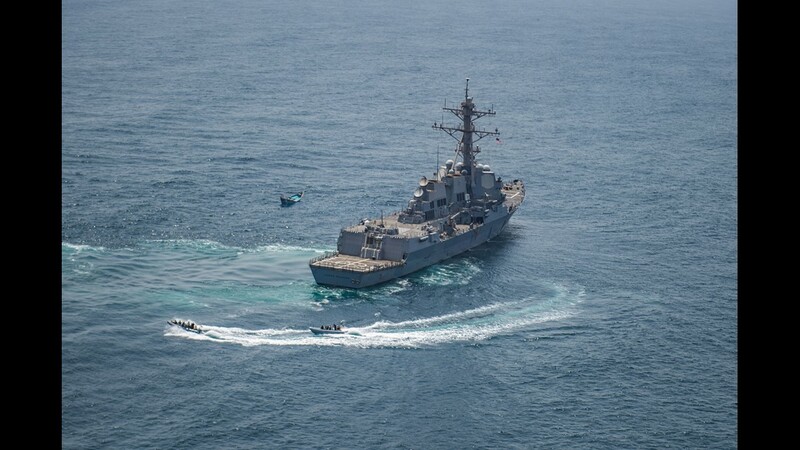 The seizure by the guided-missile destroyer USS Jason Dunham may mark the first such interdiction of weapons at sea bound for Yemen in years for American forces patrolling the region. However, the military did not say whom they suspected of smuggling the weapons. 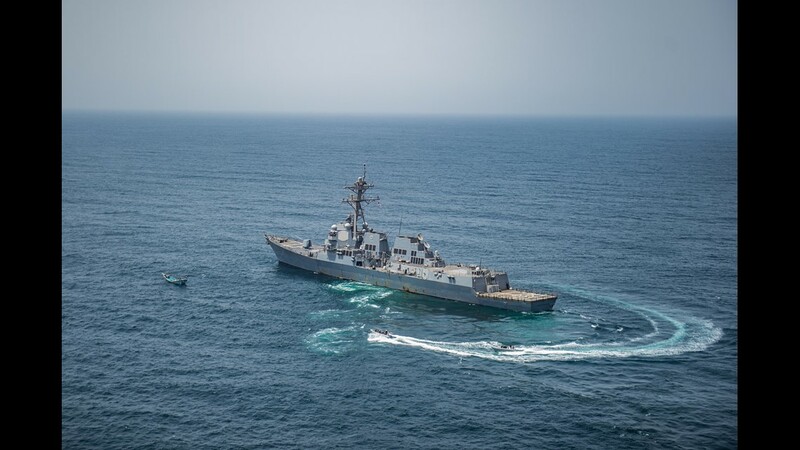 A short video released by the U.S. Navy it said was taken Monday appeared to show a skiff and a dhow, a traditional ship that commonly sails the waters of the Persian Gulf region. As the vessels bob in the high waves, people on the dhow toss large boxes into the skiff. A bag of AK-47 automatic rifles seized from a skiff by the guided-missile destroyer USS Jason Dunham's (DDG 109) visit, board, search and seizure team while conducting maritime security operations on August 28, 2018. The U.S. Navy's 5th Fleet, based in Bahrain, said sailors boarded the boats Tuesday, uncovering the arms cache. 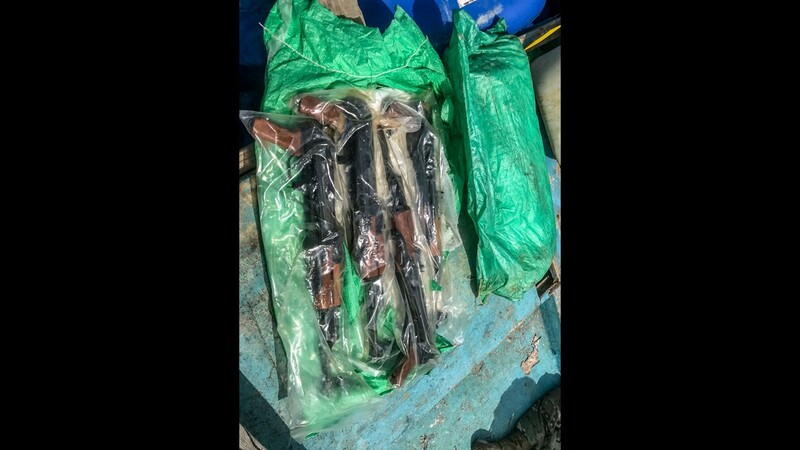 Photos released by the Navy showed what appeared to be new Kalashnikov rifles wrapped in plastic. It said those aboard the vessels were handed over to Yemeni forces loyal to its exiled government in Saudi Arabia. 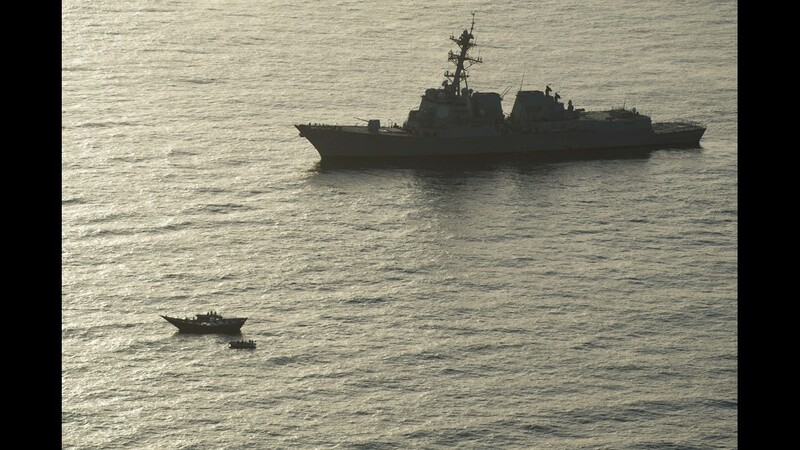 The U.S. military did not offer a location for the seizure in the Gulf of Aden, which has Yemen to its north and Somalia to its south. Smuggling of drugs, weapons and charcoal into and out of Somalia by criminal gangs and militant groups remains common. 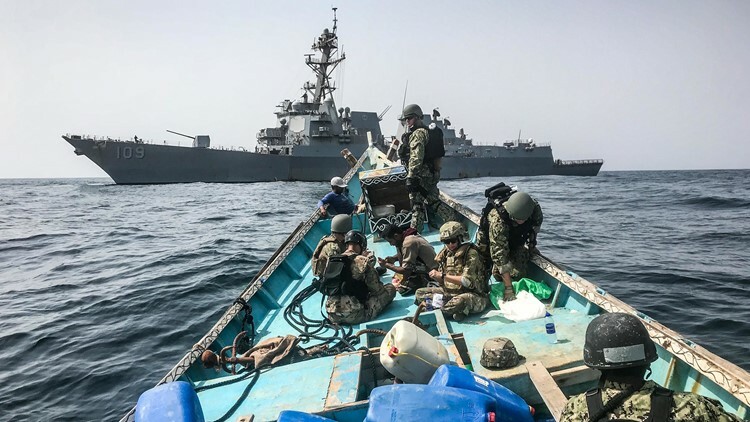 A visit, board, search and seizure team from the guided-missile destroyer USS Jason Dunham (DDG 109) inspects a skiff as part of maritime security operations. 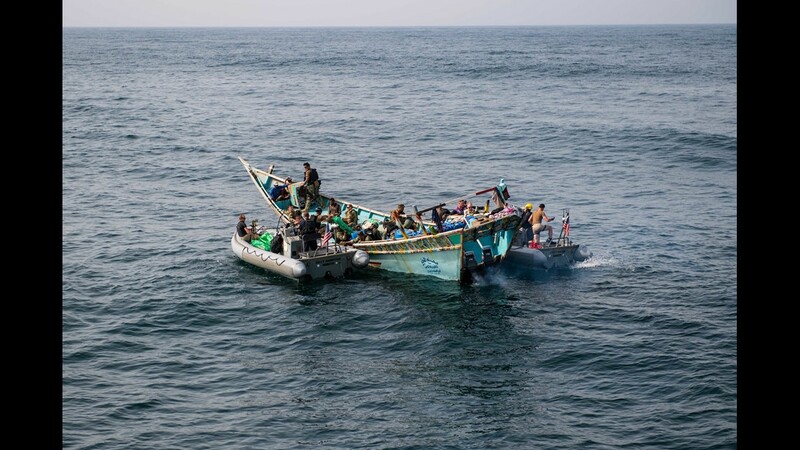 The stateless skiff was found carrying a shipment of over 1,000 illicit weapons. 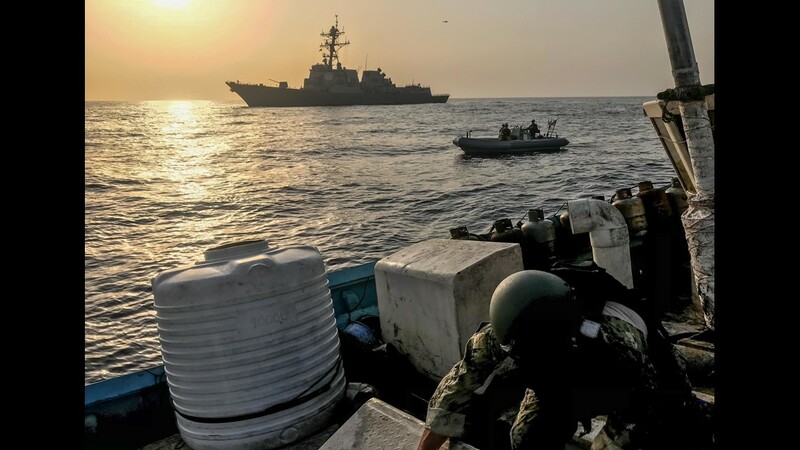 The 5th Fleet repeatedly has accused Iran of smuggling arms via the sea to Yemen's Shiite Houthi rebels, who have held Yemen's capital, Sanaa, since September 2014. It points to seizures over a four-week period in early 2016, when coalition warships stopped three dhows in the Arabian Sea. The dhows carried thousands of Kalashnikov assault rifles as well as sniper rifles, machine guns, rocket-propelled grenade launchers, anti-tank missiles and other weapons. Iran denies arming the Houthis. One dhow carried 2,000 new assault rifles with serial numbers in sequential order, suggesting they came from a national stockpile, a report by the group Conflict Armament Research said. The rocket-propelled grenade launchers also bore hallmarks of being manufactured in Iran, the group said. The U.S. has supported a Saudi-led coalition fighting the Houthis since March 2015. Ensign Sean Standard, left, and Logistics Specialist 2nd Class Ray Sanders take inventory of a large cache of over 1,000 AK-47 automatic rifles in the hangar bay of the guided-missile destroyer USS Jason Dunham (DDG 109). U.S. Navy Sailors, assigned to the guided-missile destroyer USS Jason Dunham (DDG 109), unload a large cache of AK-47 automatic rifles seized from a skiff onto rigid-hull inflatable boats as part of maritime security operations. 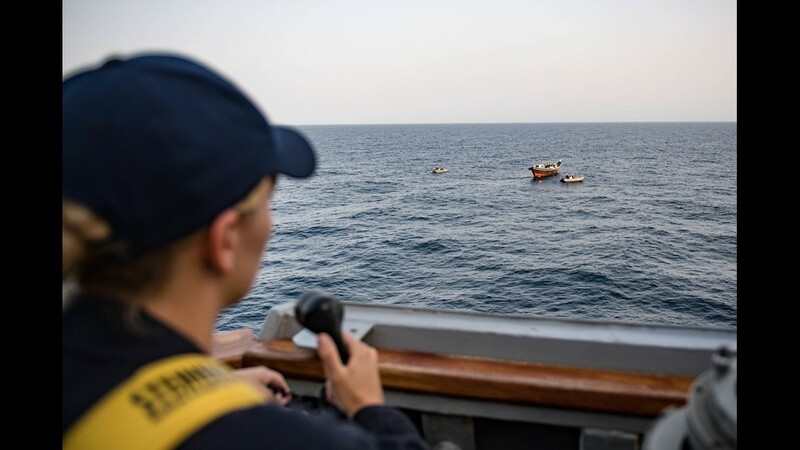 U.S. Navy Sailors survey from the bridge wing of the guided-missile destroyer USS Jason Dunham (DDG 109) as the ship's visit, board, search and seizure team inspects a dhow as part of maritime security operations. 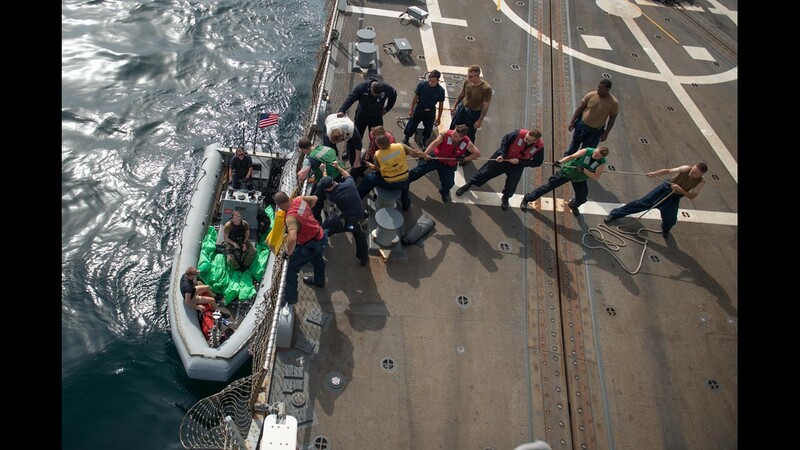 U.S. Navy Sailors aboard the guided-missile destroyer USS Jason Dunham (DDG 109) heave a line to on load weapons seized from a skiff following a flag verification boarding as part of maritime security operations. 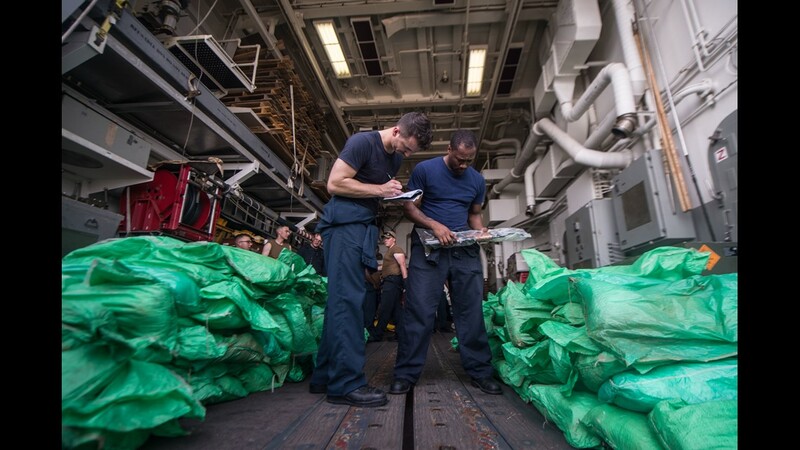 U.S. Navy Sailors aboard the guided-missile destroyer USS Jason Dunham (DDG 109) heave a line to on load weapons seized from a skiff as part of maritime security operations. 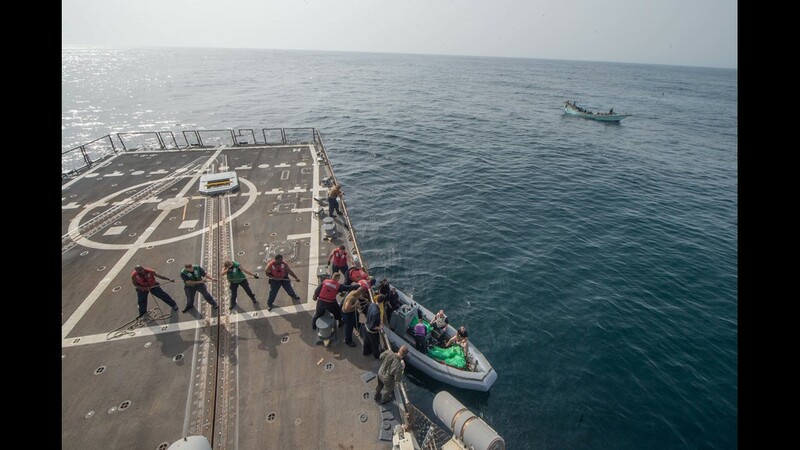 A visit, board, search and seizure team from the guided-missile destroyer USS Jason Dunham (DDG 109) approach a skiff during a flag verification boarding as part of maritime security operations. 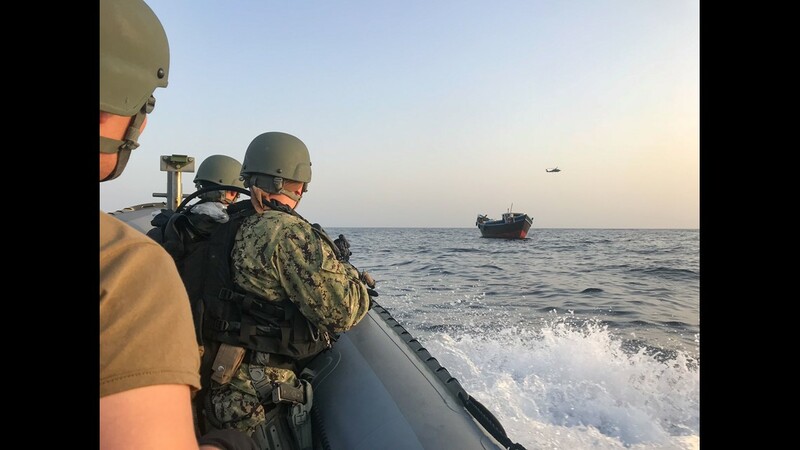 A visit, board, search and seizure team from the guided-missile destroyer USS Jason Dunham (DDG 109) approach a skiff during maritime security operations. 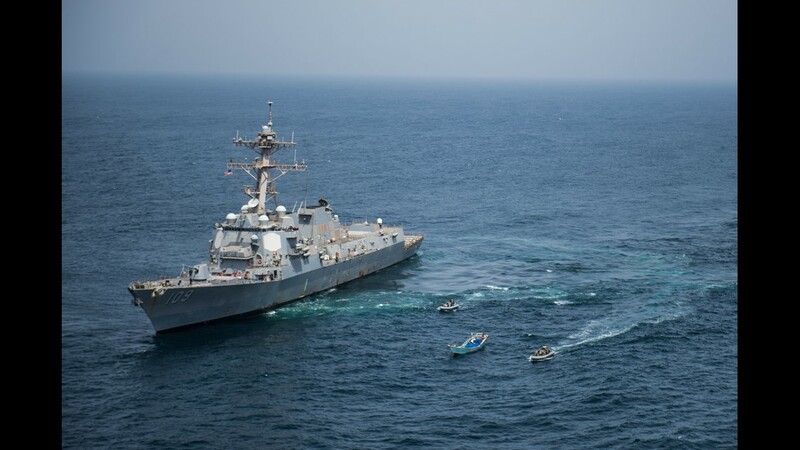 A visit, board, search and seizure team from the guided-missile destroyer USS Jason Dunham (DDG 109) approach a skiff during maritime security operations. 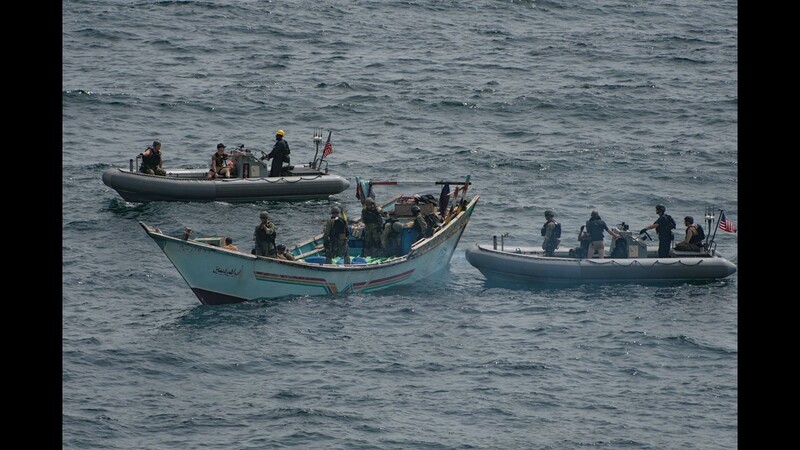 The stateless skiff was found carrying a shipment of over 1,000 illicit weapons. 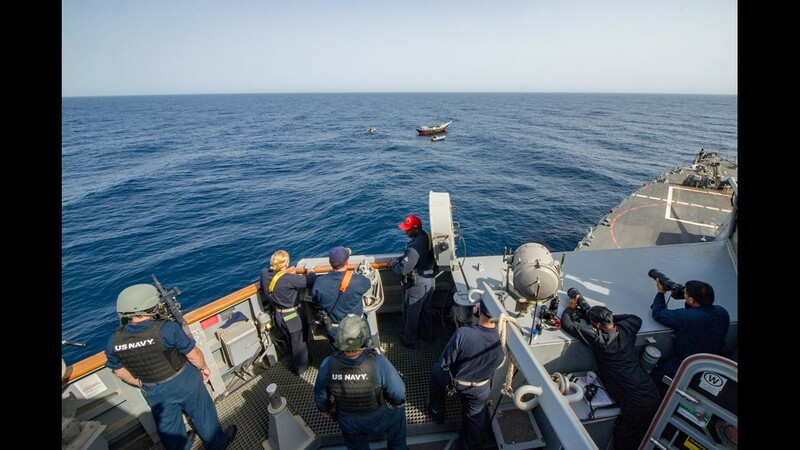 Ensign Nicole Hetzer conns from the bridge wing of the guided-missile destroyer USS Jason Dunham (DDG 109) as the ship's visit, board, search and seizure team inspects a dhow as part of maritime security operations. 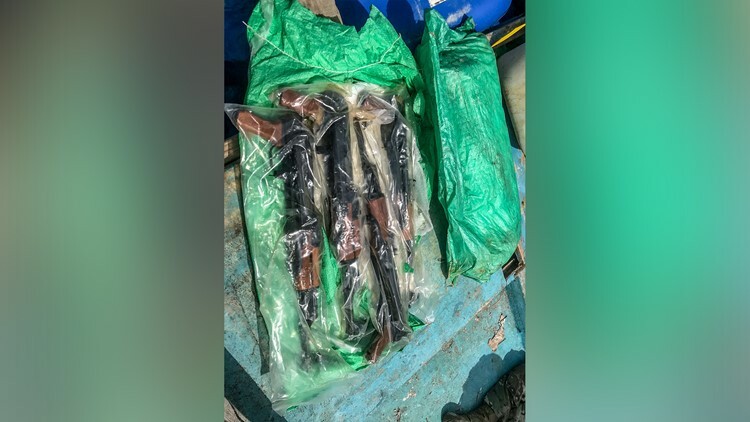 A bag of AK-47 automatic rifles seized from a skiff by the guided-missile destroyer USS Jason Dunham's (DDG 109) visit, board, search and seizure team while conducting maritime security operations. Sailors from the guided-missile destroyer USS Jason Dunham (DDG 109) inspects a dhow while conducting maritime security operations. 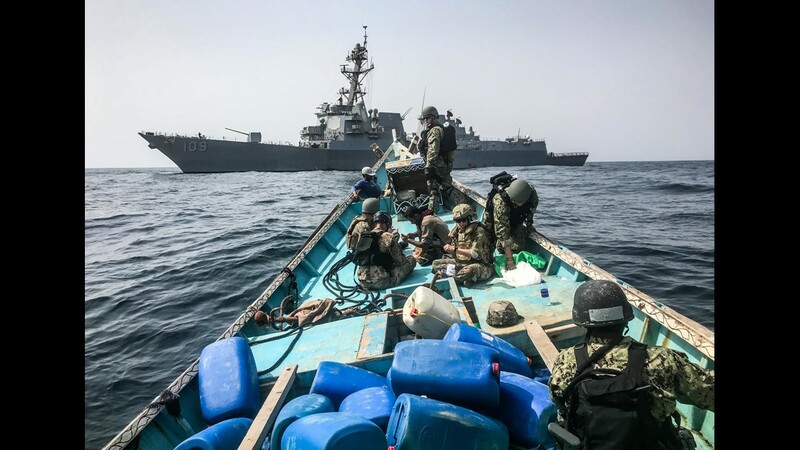 A visit, board, search and seizure team from the guided-missile destroyer Jason Dunham (DDG 109) inspects a dhow, left, from rigid-hull inflatable boats as part of maritime security operations.